My friend, Producer Mark Ovenden, posted this on his Facebook page a while ago and I am super proud to be able to post it here for you. What am I doing posting a page from an old Radio Times, you might wonder? 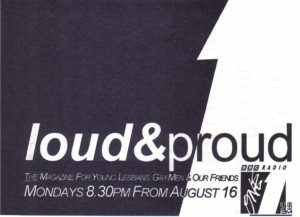 Well – in August 1993 Mark Ovenden, Chris and I (and Boy George, Hufty and a few other mega icons from the LGBT community) created this programme called Loud and Proud. 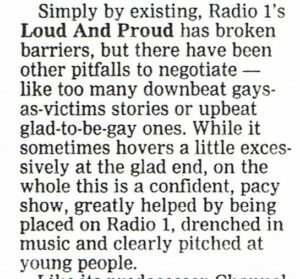 It was a magazine programme specifically aimed at young gays and their friends and it was way ahead of its time. In 1993 there were few black women on radio (no more than five) and there were no gay radio stations or shows anywhere yet we took this show to Radio One with me at the helm. We faced opposition from MPs, people wrote angry letters to the Press, you wouldn’t believe the trouble it caused. It set the tone for a more diverse, inclusive and accepting world of radio and music programming and was eventually lauded and applauded. I am honoured to have been chosen to front this show and thankful for having had the experience of working for BBC Radio One.